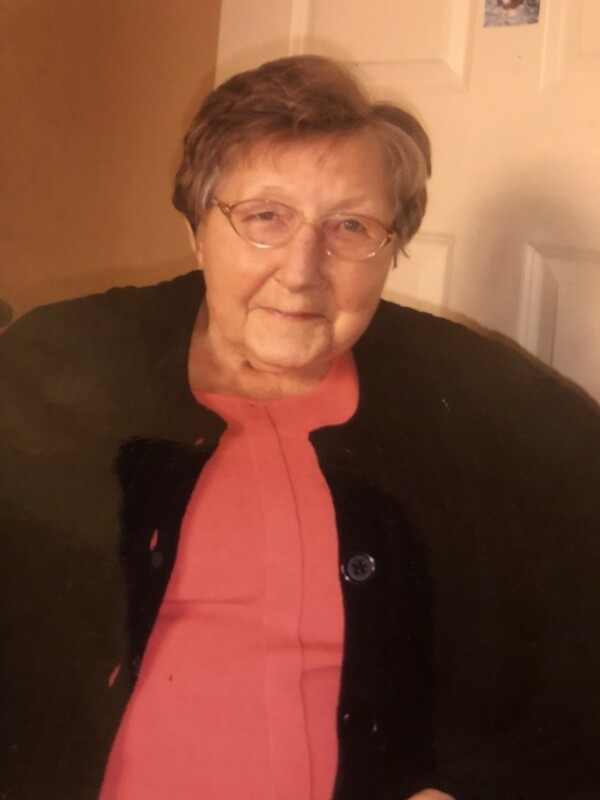 Yvonne Mellott formerly of Grassland, Alberta, beloved wife of the late Dale Mellott, passed away peacefully at Edmonton on January 27, 2019 at the age of 94 years. Yvonne was born in Plamondon on September 15, 1924 to parents Esdras and Melinda Belanger. She was the fifth child in a family of nine children. Yvonne married the love of her life, Dale, on October 21, 1943 and together they raised eight children and enjoyed 57 years of marriage before Dale’s passing on July 23, 2000. Yvonne’s passions included spending time with her family, gardening, music, following her favorite sports teams (Edmonton Oilers and Edmonton Eskimos) and being outdoors. She enjoyed fishing, hunting, curling, skidooing in the winter and weekends at the cabin at Eleanor Lake. For Yvonne, it was always the special efforts that set her apart, like her famous mouth-watering cinnamon buns and grape jello set in hockey puck moulds. Because of this, her grandchildren and great-grandchildren fondly referred to her as “hockey puck” Grandma. Yvonne will be remembered as a loving and committed wife, mother, sister, friend and neighbour. She lived her life with faith, grace, purpose and determination. Left to cherish her memory are her eight children: five sons, Richard (Joyce), Gordon (Delilah), David (Rose), Barry (Wanda) and Timothy; three daughters, Doreen Sikora, Audrey (Don) Shapka, and Sheila; 21 grandchildren; 27 great-grandchildren; two great-great-grandchildren; one sister, Fern (Armand) Beaudoin; numerous nieces and nephews; and other family and friends. Yvonne was predeceased by her husband Dale; her parents, Esdras and Melinda Belanger; two sisters, Pauline McMillan and Marcelle Dakin; five brothers (Belanger), Wilbert, Herald, Hubert, Ovila (Bill), and Paul; one son-in-law, William (Bill) Sikora; one grandson, Brian Mellott; and one great-grandson, Darien Omelchuk. Funeral services will be held on Saturday, February 2, 2019, at 12:00 p.m. at St. Alphonsus Roman Catholic Church in Boyle, Alberta. The family expresses their gratitude to the dedicated staff of Miller Crossing Long Term Care Home for the care provided to their mother and for all the prayers, actions and kindness of family, friends and neighbours. In lieu of flowers, family and friends who so wish may make memorial donations to the Alzheimer Society.